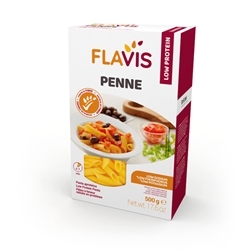 Flavis pasta is appropriate for a low protein, low sodium and low phosphorous diet. Ingredients: corn starch, rice starch, cellulose, brown sugar syrup, chicory inulin, vegetable palm oil, rice flour, safflower extract, beta-carotene. Bring a sufficient quantity of water to boil (2 cups of water per ½ cup of dry pasta). Add the pasta and salt according to taste and dietary allowance. Boil for 5-7 minutes, stirring regularly. Shelf Life: 24 months - Store in a cool, dry place.